The faith and practice of the early Church in the first millennium provide the foundation for how we worship at St. Chad’s. Our statements of faith are those contained in the Creeds, the Ecumenical Councils, the writings of the early Church Fathers, the Thirty-nine Articles of Religion, the Book of Common Prayer, and the Ordinal. These proclaim, in part, a Triune God, and a Church established by Jesus Christ that is properly ordered through a three-tier ministry of bishops, priests and deacons. The central act of worship on Sunday mornings is Holy Communion, which is also known as the Lord’s Supper, the Holy Eucharist, or Mass. We take our liturgy, and prayers that are rich in history and meaning, from the 1928 Book of Common Prayer. 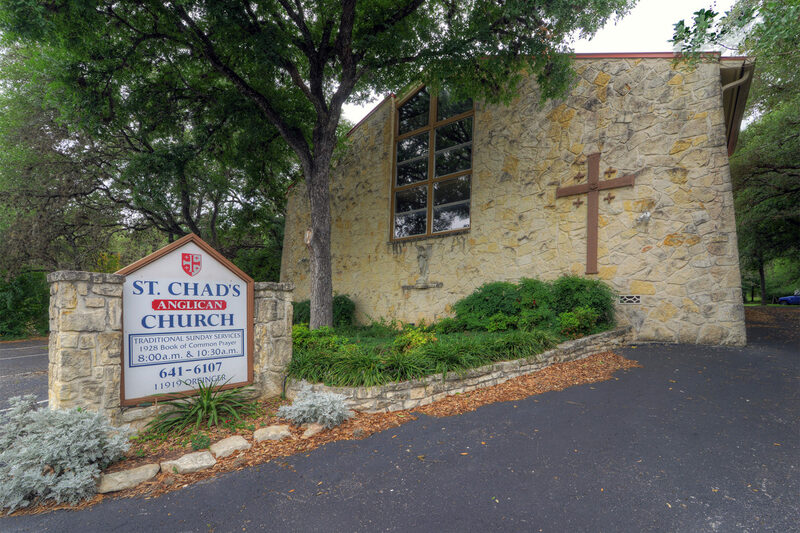 Upon entering St. Chad’s, you will find an atmosphere of quiet and reverence. This time and space in which we worship is sacred and holy. Parishioners begin by praying silently, and setting their hearts on the worship. We show forth our praise in many ways, including our posture. We generally stand to sing, sit to listen, and kneel to pray. As a visitor, we do not expect you to know all the gestures and postures. You are a welcome guest in Christ’s house, and a brother or sister of ours; focus more on the praise than the posture. The Holy Communion is divided into two parts. The first centers on God’s Word spoken to us through the passages of Scripture, and given application to our lives through the sermon. The second part is centered on the Altar and the Sacrament of Christ’s Body and Blood through the consecrated elements of bread and wine. Generally, those who have been Baptized and Confirmed, are repentant of their sins, and believe in Christ’s Real Presence in Communion, are welcome to receive with us. Those who have questions about our practice, or wish only to receive a blessing, may cross their arms over their chest when kneeling at the Communion rail. Other services offered at various times include Morning Prayer (Matins), Evening Prayer (Evensong), and Compline. Sacramental Confession is always available by appointment. We pray your visit with us will be enriching to your faith. Please feel free to reach out to our clergy and staff with any questions or concerns. Chad, or Ceadda, was born in ancient Britain, probably about 620, to Saxon parents. His people had been pagan, but his parents were baptized by St. Aidan. Thus, along with several others, he represents Celtic, rather than Roman Christianity. As a youngster he was given to the bishop of North Umbria to be both pupil and attendant. Later he seems to have gone to the Irish monastery- schools established by St. Patrick, and then to Iona, where he was ordained priest, and, after the death of two of his brothers in a plague, eventually became head of a small abbey near Whitby. Chad is perhaps best known for not being Archbishop of York. 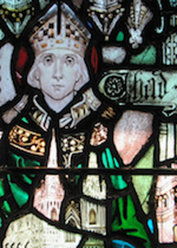 In mid-life he returned to North Umbria, being called by its king to be chief bishop there (thus, Archbishop of York). He was elected, and duly installed, but various persons raised objections (on the grounds that his consecrators were bishops who followed the Celtic church calendar and customs rather than the customs then being imported from the continent and from Rome). Not wishing to cause division in the Church, Chad withdrew. 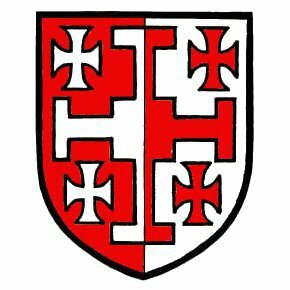 He went to half-pagan Mercia as a missionary bishop, and made his home in Lichfield. He was there for only two and a half years before his death, but he made a deep impression, traveling on foot throughout his territory. This tendency to walk rather than ride a horse was a deliberate attempt by Chad to operate at the level of the peasants for whom he cared. He seems to have won his saint ship by this, and by the power of his praying. Although, like many of his day, he was terrified by thunderstorms, he would spend the duration of a storm praying constantly for all who were exposed to its fury, and gave the advice that when in great fear we should pray for others, and if possible to help them, forgetting ourselves, our spirits will be calmed.